Gov. Eric Greitens after his State of the State speech in January. Gov. 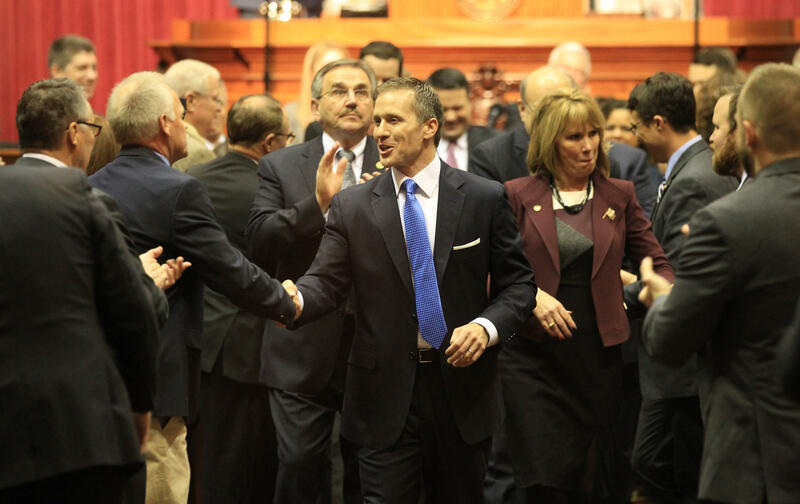 Eric Greitens, who has called for ethics reforms, faces a fine from the Missouri Ethics Commission for failing to report that his gubernatorial campaign received a donor list from a charity he founded. The ethics commission document was signed this week by Greitens and attorney Michael G. Adams, who the Kansas City Star reported is also an attorney for both 501(c)(4) nonprofits tied to Greitens — neither of which have to disclose their donors — as well as general counsel for the Republican Governors’ Association, which donated millions to Greitens’ gubernatorial campaign, Greitens for Missouri. The violation was a "simple campaign finance matter — not a major ethics matter," Greitens’ campaign adviser, Austin Chambers, told The Associated Press on Saturday. Greitens has filed an amended campaign finance report for April 2015, valuing the donor list as $600 in-kind contribution from Daniel Laub, his campaign manager. Under federal law, such donor lists can be rented to all candidates’ campaigns for fair-market value, but cannot be given to a campaign. The Ethics Commission imposed a $1,000 fee, most of which would be waived if Greitens pays $100 and commits no other violations in the next two years. The AP first reported in October that Greitens' campaign accessed a donor list from the nonprofit The Mission Continues, a group that has raised millions of dollars to help veterans of the wars in Iraq and Afghanistan make the transition into civilian life. That list was used to raise about $2 million from people and entities. State Democratic Party Chairman Stephen Webber said Saturday in a statement that Greitens "embodies everything ... about the culture of corruption in Jefferson City," and that his "problems with ethics just don't go away."